Alistair Hulett is familiar to many of us. As the driving force behind Roaring Jack, and with a slew of other musical ventures to his name, he wasn’t easy to ignore. Hulett was well-known for being passionate, genuine, and for possessing a healthy sense of right and wrong. He managed to direct his feelings, with insight and great care, into the songs he wrote. Hulett had a direct connection with many organisations, including the SA-based Songwriters, Composers and Lyricists Association (SCALA) – he’d been one of the judges in the 1994 Songwriters Event. The sudden and untimely passing of Alistair Hulett in January 2010 affected many people – at 58 years of age, most of us felt that there was much more to come from this gifted writer and performer. The Alistair Hulett Memorial Fund (AHMF) was, according to http://www.alistairhulett.co.uk/, set up to preserve the legacy of Hulett’s music, and to promote “social justice and equality through music and struggle”, in keeping with Hulett’s sensibilities. 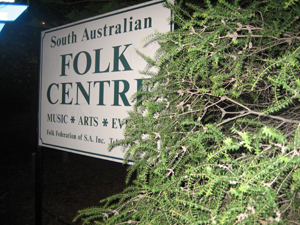 The notion of a tribute concert in honour of the greatly missed Hulett was conceived by Peter Rooke, Vice-Chair of the Folk Federation of South Australia, even before he knew that the AHMF existed. 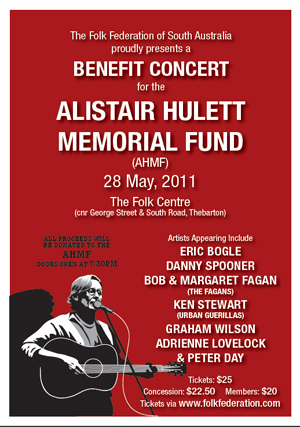 Before long however, Rooke, the AHMF, the Folk Federation and the wider folk community were all united in the cause, and the Benefit Concert for the Alistair Hulett Memorial Fund became a reality. On a coolish Saturday night in May, performers, organisers and fans alike descended on the Folk Centre for a night that promised much. Noted musicians such as Eric Bogle, Danny Spooner, Bob & Margaret Fagan, Ken Stewart, Graham Wilson, Adrienne Lovelock and Peter Day had all accepted to take part in the concert, a measure of just how much Alistair Hulett meant to them. The evening’s compere Eric Ford explained to a packed venue just how things were going to work. Performers would each play four Hulett songs, and the interval would be used as an opportunity to raise extra monies for the fund through the agency of raffle sales and an auction. Without any further ado, the lights went down and the show went ahead. I was lucky enough to be invited by my good friend Ken Stewart to perform with him on stage; this concert occurred in the midst of a series of our own gigs. It added an extra dimension to our week of recording and performing and it was a privilege to play four numbers that we’d been rehearsing furiously for a few weeks. Ken’s rousing version of Yuppie Town helped to kick the night off appropriately. The second act was Graham Wilson, who’d come over from Perth to be part of the concert. Despite the fact that he was, like quite a few of the performers, suffering from a heavy cold, he performed flawless interpretations of a selection of songs, my favourite being Among Proddy Dogs and Papes. For his rendition of Ways of a Rover he was joined by the impressive Jeri Foreman on fiddle. Bob & Margaret Fagan, of Australia’s pre-eminent folk family (that would be The Fagans), shared memories of their friendship with Alistair and their love of his songs. Their stirring acapella version of Don’t Sign Up For War was a standout, along with The Siege of Union Street, from the Hulett and Dave Swarbrick album The Cold Grey Light of Dawn. The iconic Eric Bogle, also fighting off the ‘flu, provided some fond and enjoyable remembrances. He presented a blend of Hulett originals and traditional Scottish songs such as The Fair Flower of Northumberland. I think my favourite was Suicide Town, along with the tale that preceded it. 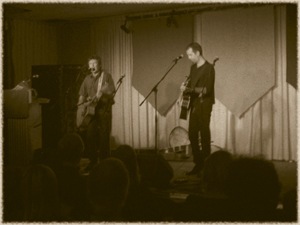 Bogle is an engaging performer and the audience was completely immersed in both the music and banter. The penultimate act was Adrienne Lovelock & Peter Day, who began by performing an unreleased and very impressive (and pointed) Hulett number, Way Too Long in the Tower of Song. They wowed the audience with three other powerful songs, Victor Jara of Chile, No Half Measures, finishing with an especially moving rendition of He Fades Away. Danny Spooner was the last scheduled act of the evening, and his take on Hulett’s Destitution Road was a highlight. Jeri Foreman returned to the stage to accompany Spooner after his solo acapella version of The Workers’ Song, as did all of the evening’s performers for a rendition of John Warner’s Bring Out the Banners. In keeping with the feel of the entire evening, Spooner’s performances were from the heart. The finale saw all performers stay on stage to accompany (a recording of) Hulett in an inspiring version of The Internationale; sung with gusto and appreciated by the upstanding audience. And, with that, the evening came to a close. Guitars were packed away, 130 or so thrilled punters filed out into the cold evening air, chairs were stacked and the doors closed. A successful evening had ended. What endures, of course, is the music of a supremely gifted, and sadly missed, songwriter & performer.